Team management training is useful for developing an employee’s managerial skills. This training is necessary because many employees lack these skills when they are first promoted. Developing good leadership in your new managers will increase employee productivity. As an HR manager, you can hone a manager’s team leadership abilities. A talent management system can be implemented post-training to improve overall management. Before this can be done, however, optimal training is necessary. In this article, we will discuss which skills to teach in team management training. 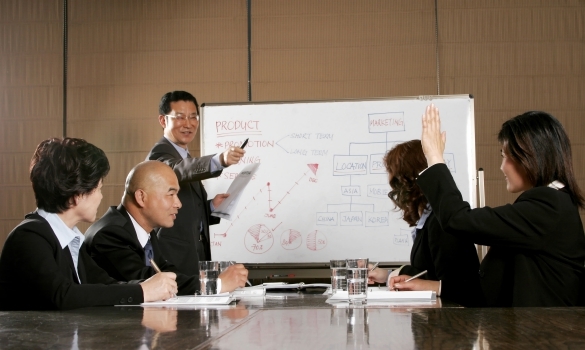 Delegation is one of the first skills to teach in management training. To properly train your managers to delegate, have them work on providing context and picking the right employees for each position. Practicing these skills will enable your manager to command more respect from their team. It shows that the manager trusts their workers. Effective delegation will also allow for increased productivity from both the manager and employees. When conducting team management training, teach the skill of delegating to improve teamwork. Motivating teammates is the next skill to teach in team management training. It plays a huge role in increasing employee productivity. Having properly motivated teammates improves collaboration and problem solving. Some subsets of this skill include setting goals, creating a good work environment, and being approachable. Learning these skills will help your manager create a positive team atmosphere. This atmosphere will raise employee satisfaction, motivating them to work harder. It will also foster a sense of loyalty to the manager and to the company. Make sure that your managers are well liked by teaching them how to motivate their teammates. Giving constructive feedback in team management training is paramount for developing individual members of the team. Feedback is an effective way of learning how to engage employees properly. This skill training involves knowing when to offer advice and when to point out flaws. These approaches are useful for dealing with different types of personalities. Some employees do not respond to perceived criticism. For said employees, it may be easier to offer advice rather than pointing out flaws for their work. Other employees will continue behavior if not told immediately to fix certain issues. Giving constructive feedback will enable your managers to alter undesirable actions and promote good working habits. Teach your managers how to offer good feedback in team management training to improve the team’s performance. An advanced skill to teach in team management training is how to identify problems. To teach this skill, you need to encourage managers to have an objective, analytical perspective. This paradigm shift will enable your managers to look for issues they might have overlooked otherwise. The next step is to teach how to classify problems. Set up categories that you want your manager to put problems into. By classifying problems, managers can prioritize which issues to address and learn from previous issues. Identifying problems is a skill your managers must learn in training so that they can resolve issues more easily. Conflict resolution can be a difficult skill to teach in team management training. No matter how well the team operates, some conflict is inevitable. To solve these issues, it is imperative that your manager knows how to mediate and encourage communication. Many conflicts can be resolved by having the opposing employees present their thoughts civilly. In these situations, the manager must be seen as an objective presence. Teach your managers not to criticize or take sides. Resolving conflicts quickly will improve group satisfaction and bolster teamwork. Teaching this skill in team management training will allow your managers to focus on important matters, rather than dealing with petty squabbles. Team management training can greatly improve your managers’ leadership if you teach the right skills. Show your manager how to improve team productivity through delegating, motivating, and giving constructive feedback. After boosting efficiency, teach your managers to solve problems by identifying them and resolving conflicts. If you teach these skills, you can develop top notch teams.